I look at the tiles in front of me, 16 in all, arranged in a straight line like Scrabble tiles. The type of mahjong I like to play is a bit like Rummy 500. You either create sets of three of the same suit in linear numbers (like having a 7, 8, and 9 of spades) or sets of three or four tiles of the same number or character (like having 3 or 4 aces). The tiles are big and thick, like little bricks. They have weight. There are four players at the square table, and each of them has a wall of bricks in front of them – two layers of tiles, arranged face-down in a long, horizontal row. Chinese people love to play mahjong. It’s a a lot like playing cards but with tiles. There are so many different games you can play, but the most popular ones I know of are ones with 13 or 16 tiles in a hand. The one with 13 tiles is a bit more difficult and takes more thought. With each one, of course, there’s always an element of luck involved because you never know what tile you’re going to pick. Everybody starts by first deciding how much money each point will be worth. Then eight arms stretch out towards the table, and you hear that kwala, kwala! sound of the mahjong tiles being shuffled in circular motions. Each person constructs his or her own wall (this is all done very quickly), and the game begins. After I have picked my 16 tiles, I start arranging them in order, usually by the same suit. No one else can see my hand. There are three suits – sticks, numbers and biscuits, and then there are a full set of three characters, which can be considered another suit. There are often two or more tiles that go together, like 3 and 4 of sticks. I may have one 3 stick and two 4 sticks, which means I have 3 possible sets I could make (2, 3, 4 of sticks, or 3, 4, 5 of sticks or 4, 4, 4 of sticks), depending on whether someone else throws out the third tile to make my set. If someone throws out the right card, I yell out, “Peng! (hit! )” or “Chi! (eat! ),” and everyone stops as I reach out to take the tile which I then match up with the pair from my hand. I then lay the entire set on the table in front of me for everyone to see. Now, when people yell out “Peng!” or “Chi!” everyone gets very excited. You start watching as one set, then two, then three, start appearing on the table. As a person lays out more sets, they end up with less and less tiles in their hand. Other people around the table start to lean forward to examine the tiles on the table more closely, and you start hearing rumbles of, “Watch out!” or “Be careful…” or “Don’t fang pao! (don’t lose, or, figuratively, don’t blow the cannon!) Just because a person has many sets in front of them doesn’t mean they’re going to win. If you pick a tile that completes a set in your own hand, you don’t have to lay it out for everyone else to see. And sometimes, you can win without having Peng’ed! or Chi’ed! a single time. Each person takes turns in leading a hand in the game, and each hand takes about 5-15 minutes. As the minutes tick by, people start getting more and more alert because every person is completing their sets. Eyes start darting. Sometimes, the winning hand comes as a total surprise. When you win, you yell out, “Hu le! !” (won!) usually with a great deal of excitement on your face, and everyone else’s faces get excited, too. No one wants to throw out the losing tile because if you do, you have to pay money to the person who won. The person who throws out the losing card usually lets out an expression of their own and starts reaching for their stash of money which is now about to get a little smaller. Now, every so often, a person yells out, “Zi mo!” (self grab! ), and this gets everyone very excited because it means that the person who zi mo’ed was lucky enough to pick his or her own winning tile. When someone zi mo’s, every person at the table has to pay the winner (and zi mo is worth an extra point, so the winner usually gets paid more than triple). Taking the lead goes around in a circle to the left. A complete game goes for four rounds and usually takes 2 hours. In between rounds, some people get up and drink tea or go to the bathroom or get a bite to eat. It’s time to take a break. Oftentimes, when friends come over, people play two games in one afternoon or evening. The money isn’t the reason people play, usually. There are, of course, many who play mahjong to gamble. But as a social game, the money’s just something that makes things a bit more exciting. If each person starts out with $10 in their purse, you could end up winning something like several dollars to $20 for the night (or lose a similar amount), depending upon how much everyone has agreed each point is worth. Some winning hands have a lot of points, and some hands have only very few points. During hands, people chat a bit and talk about their friends, families or whatever it is that they want to share. It’s not a quiet game like poker. There’s lots of Aiyas! (when someone has made a mistake) or Zhenmebang’s (What do I do’s? when people are wondering what their next move will be). Sometimes, people even slam down a tile onto the table in their excitement. There’s a lot of laughing (usually coming from the winners, but sometimes also from the losers or anyone else). It’s loud, from the tiles to the expressions. And then there are the frequent moments of silence in between, when people are concentrating or waiting, or when everyone is holding their breath to see what tile is coming out next onto the table. 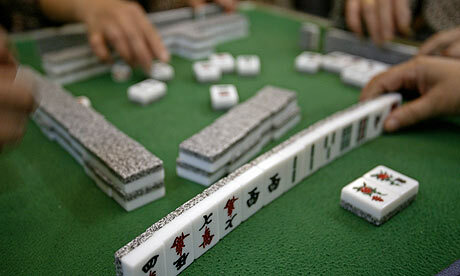 In China and elsewhere, many older people like to play mahjong, and it’s very common for people to play mahjong in elderly homes and in the parks. They say that it keeps their brains nimble and helps to fend off dementia or Alzheimer’s disease. It makes sense, in a way. Mahjong doesn’t require too much thought (like Chinese chess), but it keeps you on your toes. For each new hand, you physically have to stretch out your arms and move them around in circular motions to shuffle, and then you have to reach out to get the tiles to build your wall. You have to stretch out your arm each time you pick up a tile or throw one out. And you usually sit up straight when you play. So mahjong is physically good for you, too. You end up chatting and laughing and making all kinds of expressions throughout the game. When you add all these things together, no wonder many people think mahjong is healthy for mind, body and spirit. If you win, that’s even better. You can treat your friends, perhaps, or just keep your winnings in your pocket. But by the end of the evening, everyone usually leaves satisfied, knowing they just had a good time. This entry was posted in Health, Lifestyle and tagged Alzheimers, elderly, fun, games, mahjong by wodezitie. Bookmark the permalink. I remember my parents would play this regularly. I distinctly remember the sounds of the tiles at the end of the game when they were being mixed up by everyone. I used to use the blocks like lego to make buildings. How fun! Little kids aren’t supposed to play mahjong, but I see you found a creative way to play with the tiles! (Actually, I think I did something similar when I was little.) 🙂 Thanks for commenting!